Not sure whether I've played here in the past. But, just so you know it looks like a fun challenge blog, so I've added it to my list. This week Just Add Ink is challenging us to make cards for males. Not a problem for me, we have a lot of males in our family. When my sons came onto the planet I broke the trend for my side of the family to have mostly women. It is so much fun getting back into my stash and play with products that I ordered but never got to play with. This card was fun. I pulled out an old Close To My Heart binder full of sketches. Then from there it is Stampin' Up supplies except for the brads which were in an embellishment container that I've had since I started making cards. No clue what company they are from. Stampin' Up Supplies: Go Wild Designer Series Paper Stack, stamp sets: Guy Greetings, Gorgeous Grunge, Crumb Cake ink, dimensionals. If you are not familiar with Just Add Ink Challenge Blog or if you are, please use the clickable link above and check out the fun challenges that are going on over there. There's still time to enter this one, believe it or not it just started yesterday and I'm entering on the second day instead of sliding in at the last minute. Great "guy" card, Beverly. Neutrals work so well for a masculine card. Thanks for joining in the fun at Just Add Ink this week! 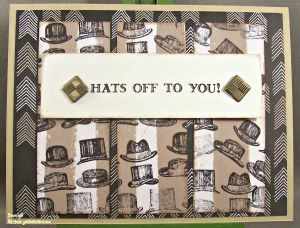 The hats, especially matched with that sentiment, make a fun masculine card Beverley. Love how you used them to create your own DSP. Thanks for joining us at Just Add Ink this week.